I finished this book over the weekend. Very interesting. I must say I was pleasantly surprised at the degree to which it incorporated exercise physiology into the subject – in fact I found myself saying: “when do we eat?” That’s a bit of an exaggeration. There’s a summary of the diet at the beginning, followed by several chapters on what to eat before, during, and after exercise. All this is broken into 5 stages. The next few sections back up the nutrition, fitness, and performance claims of the authors with their review of applicable research. The final section contains lists of EAT and DON’T EAT (my terms) followed by dozens of recipes. I wasn’t previously familiar with the Paleo Diet other than thinking “that’s the one where you eat nothing but meat, right?” This is a diet in the true sense of the word, not the vernacular we’ve all grown up with. It’s a way of eating for life, not a 6 week program to drop x number of pounds. I’ve decided to experiment with this. I had recently decided to put myself on a reduced gluten diet (I hesitate to say gluten free) and this diet is a natural extension of that – although there are many more off-limits foods than a GF diet. I would sum it up with this quote: “the Paleo Diet [is] …unrestricted consumption of fresh meats, poultry, seafood, fruits, and vegetables. Foods that are not part [of it] include cereal grains, dairy products, high-glycemic frutis and vegetables, legumes, alcohol, salty foods, processed meats, refined sugars, and nearly all processed foods.” There are exceptions. For instance, the authors recognize that simple carbs in the form of sugars can be a necessary fuel in certain stages before, during, and after endurance exercise. One of the more intriguing parts of the book is how the diet has the potential to teach your body to burn more fat and dip into your glycogen reserves less until it’s absolutely necessary. I’m interested in anything that can avoid the wall – more of a marathon problem than a half marathon problem. The book does have a specific section on what to take in during various time periods of exercise – including what for most of us mortals would include the half marathon distance. I’m not trying this to lose weight. My goals are increased performance and health benefits. The book makes a good case for both of these. I’ll let you know how it goes. I will say that it’s been hardest to cut out/down dairy and refined sugars. Especially when they are combined into ice cream. 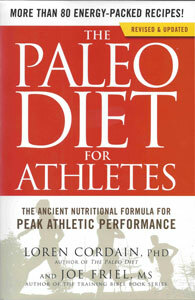 However I am encouraged by mention of the 85% rule – follow the diet 85% of the time. That might be doable. To balance this perspective I’m also planning on picking up Scott Jurek’s “Eat and Run” 100% plant based diet at some point. I confess some natural skepticism of the vegan diet’s ability to give the body everything it needs, although Scott has certainly earned his credibility to speak on that issue (Badwater, Western States to name a few). The Birkenstock of minimalist running shoes, wouldn’t you say? Note the roomy toe box (a definite plus for the forefoot striker). Altra also recommends this funky lacing pattern. I have to agree that it locks it down where you want up top, without causing any unwanted pressure right above the toes. For some reason not all manufacturers are putting reflective material on their minimalist shoes. Altra realizes that some of us run when there is no sun! The upper seems nice and breathable – an airy mesh – however there is a suspicious crinkly plasticky sound – seems to be going away with break-in. The sole is firm without being hard. Not very flexible. Definitely not cushy, and if “ground-feel” is your thing, this isn’t your shoe. Looks very durable though. Not a shoe you’re going to throw away after 100 miles. The bottom. I count 5 toes! Not articulated. This is no slipper and not a VFF competitor. 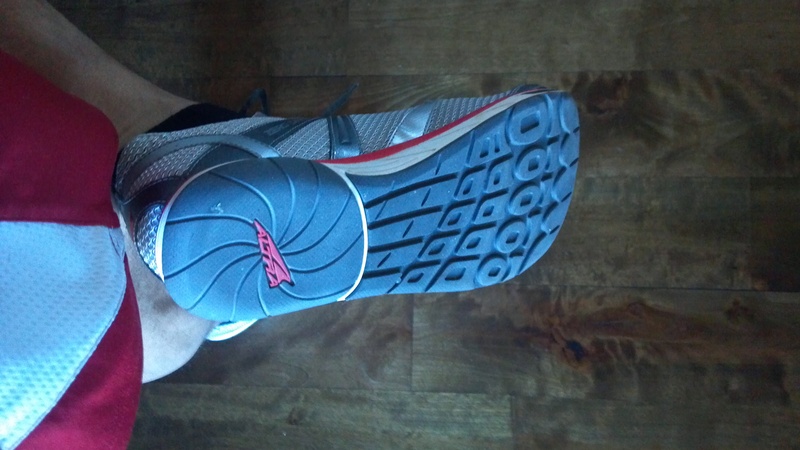 It comes with a heel lift you can insert under the insole if you’re new to forefoot striking. I eschewed it, being used to zero drop shoes. I transitioned though a couple of years ago, and easing into it did seem like a wise thing to do. As I have stated as an aside in a previous post, I like the shoe but don’t love it. I run barefoot on grass enough that when I do hit the pavement in a shoe I am willing to sacrifice some durability for some flexibility and cush. This ain’t no racin’ shoe either. I don’t have a weight on it – I wear a size 12 anyway so it would be meaningless without a point of reference. It feels a bit heavier and clumsier than some of my other shoes e.g. the NB MR00. 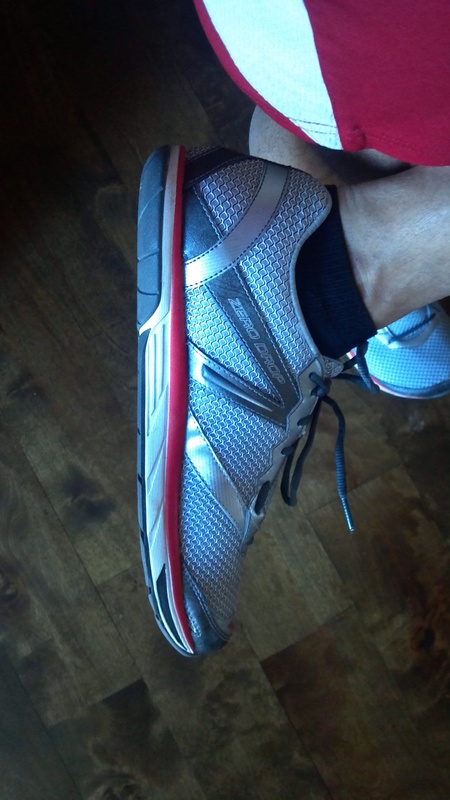 It’s a good durable trainer though if you need to or want to pound the pavement in a zero drop offering. Rating: 3 toes out of 5. I did this yesterday. It’s a staple in my cross-training rotation. It’s intended to build core strength, but it’s a pretty decent aerobic workout if you do it fast enough and keep your pulse up. It was developed by a doctor who just happens to be a marathoner and triathlete too. I recommend watching the videos to get your form down so you’re doing the exercises correctly. When I first started doing this, someone posted a PDF in the comments that just has them as a list. For the short term memory/Dorie crowd (that’s me) it helps to refer to it so you get your reps and times right. If anyone wants a copy, let me know – I don’t see it any more at the link. A word of advice: don’t pick the heaviest barbell you can lift. I usually do this with 10 or 12 pounders. What can I say – I’m no Arnold Schwarzenegger. (I know, duh). When I was younger, I saw running as something you had to do to get into shape to play soccer. I went out for track in high school, but injuries discouraged me and I didn’t stick with it. I ran more and less through my 20s and 30s, never with any kind of race or numbers goals. As my metabolism slowed in my early 30s, I turned to running for weight control. However, after moving to Kansas City a combination of injury, devoting more time to our growing family, and flat-out laziness, I added nearly 40 pounds I didn’t need. With my 40th birthday on the horizon, I made some changes. I’m healthier now than I was 20 years ago. I’ve found that running causes you to reevaluate everything – especially how you eat and how you budget your time. I run barefoot/minimal because it’s fun and it feels good! I switched to barefoot/forefoot striking a couple of years ago after reading Born to Run. It’s not for everyone, but it made sense for me. I was increasing my mileage in traditional running shoes and it seemed like the more I ran, the more I hurt. The switch reduced my impact and put the fun back into running. I’ve tried a variety of minimal shoes over the last couple of years (see one of my earliest blog posts) but I try to run barefoot when I can. I especially enjoy barefoot speed work around the irrigated soccer field close to my house. It’s like carpet! I race because I’m competitive and it helps me set goals. A friend talked me into doing the Kansas City Zoo Run just a few years ago – my first timed race since high school. That did it. We started out running together, and then at some point during this 4 mile run he said, “you want to run faster, don’t you?” I answered honestly. I took off and haven’t looked back. As my fitness improved, I added the half marathon and eventually the full marathon. I enjoy racing all distances from 5K to the marathon. Every distance has its challenges and unique requirements. I’ve achieved a few of my “numbers” goals now (the toughest being a BQ last fall), and I think that will help me enjoy racing even more. The comraderie and sense of achievement can’t be beat. Everyone who toes the starting line has already accomplished something significant. Racing often starts as a bucket-list line item – but don’t forget to have fun! That was a cold run Sunday morning. Air temperature was a balmy 13F at 5am. I didn’t check the wind chill but winds were out of the NW at 10-15 mph. As I do more often than not, I overdressed slightly. It’s always easy to pick the perfect combo after a run is over. In hindsight I would have ditched the Wb shell (as a windbreaker – surprisingly unnecessary) and gone with just the l/s fleece and the compression shirt up top. I love these two new compression shirts I got for Christmas – but they are throwing off my usual cold weather combos because they are so effective at keeping me warm! 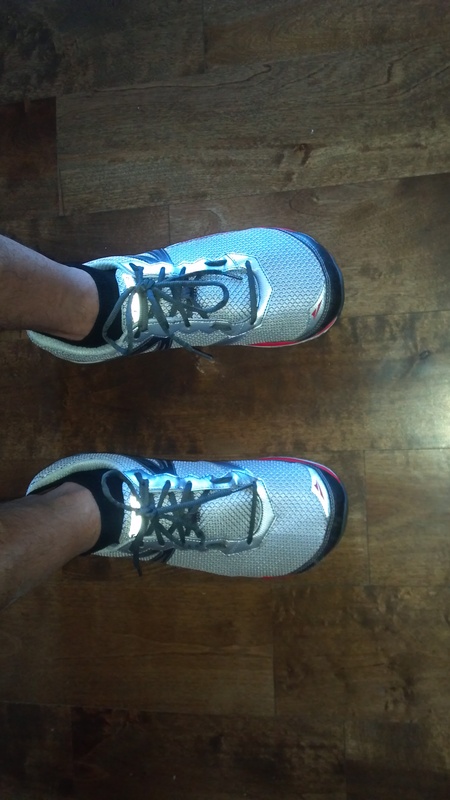 This was a nice 4m recovery run in my new Altra Instincts (3rd run in them). They’re not going to be my new favorite shoes. I like them, I just don’t love them. I guess I am hard to please but my favorite shoe is no shoe, although that’s just not an option in this season and/or on pavement. I’m going to be ordering a pair of the new Mizuno Wave Evo Cursoris in the next week or so. I’m thinking those over the Levitas, solely (pun intended) based on wanting a training shoe over a racing shoe at the moment. Running with a friend is a great way to get going early on a cold morning. There’s no excuses when staying in bed means your running companion is going to be jogging in place at your rendezvous point wondering where you are. A final thought on cold weather running. My face was COLD heading into the wind – I just had a hat on. Nelson had selected a balaclava (also known as a baklava in my family). I was jealous as we headed north, but he ditched it as headed south. I took the dog out for a short run an hour later and decided to try a balaclava I bought several years ago but never used. We walked for a while on the way out – it was great for that. We ran back, and I felt like someone was holding a pillow over my face. I just could not get enough air. Ellie sets a pretty good pace though when she realizes she’s headed back to see her mommy! (my wife) So, I’ll either be performing surgery on the balaclava or leaving it behind the next time the temps are this low! I’ll be posting later this week with either a full review of the Instincts or a description of my elliptical/recumbent stationary bike/treadmill long run substitute from Saturday. How you fit your training into your already packed schedules? What are you eating while training? Do you train with a group, friends on your own? Some of your challenges you are experiencing while training. Some milestones you hit while training. Do you cross train? Is Hospital Hill Run part of a bigger training plan? If you’re following, I promise to place my minimally-shod spin on these issues, along with my usual attempts at humor, irony, and sometimes unintentionally; Alanis Morisette-irony. As of June 2012; average of 5 different formulas I found on the web puts my max heart rate at 179. I may have to revise since I’ve had a birthday in the mean time! One website recommends 80-87% of max as ideal training zone. Hal Higdon on Livestrong says 65-75% on long and recovery runs; intense workouts ok 90-95%.